This week's recommended free movie shouldn't really need an introduction. The 1977 Steven Spielberg movie Close Encounters of the Third Kind is a classic story of contact with aliens who have been abducting humans for purposes unknown. 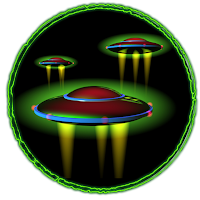 The classification system for encounters with unidentified flying objects (UFOs) was devised by astronomer and US Air Force consulting UFO analyst J. Allen Hynek. Later he founded the Center for UFO Studies. In the movie, Richard Dreyfuss plays a regular-seeming guy who stumbles into what will be the first official meeting between humans and extraterrestrials. I think that's what makes the movie so compelling; since the characters don't really know what is going on, we viewers are taken on the journey of discovery with them. Of course the movie also has strange encounters with flying objects, escapes from government agents and the best alien music scene ever to keep it entertaining. And, unlike so many movie aliens, when we humans finally meet them, they don't blow up our buildings or steal our natural resources, although they do kidnap folks for unknown purposes. Perhaps aliens really can come in peace. Hynek consulted on the movie, and even makes a cameo appearance during the close encounter scene, giving it a bit of scientific (or at least scientific-seeming) authenticity. Maybe my perception is skewed because I was only ten in 1977, but I think that was one of the best years ever for science fiction flicks, what with both Close Encounters and Star Wars (Episode IV) in theaters. I think both movies have stood the test of time, but it's the first deep notes booming out from the alien ship in Close Encounters that gives me shivers..
Watch Close Encounters of the Third Kind for free at Crackle.com.